Lent Madness continues this morning with an intriguing (aren’t they all?) match-up between Ephrem of Edessa and Thomas Cranmer. Will the “Harp of the Holy Spirit” be played by the author of the first Book of Common Prayer? Only you and the next 24 hours will decide. In recent action, David Oakerhater bested Martin of Porres by a nose. Or, technically speaking, it was by the hair of a nostril — with over 2,100 votes cast, David won by a mere 15 votes. If you didn’t think your vote counted, you were wrong! Nicknamed ‘the harp of the Holy Spirit,’ Ephrem (306-373) was a renowned Syrian teacher, poet, orator and defender of the faith. Ephrem was born in Nisibis, which is the modern Turkish town of Nusaybin, on the border with Syria. At 18 he was baptized by the Bishop of Nisibis and accompanied him to the famous Council of Nicea in 325. In 363, Ephrem retired to a cave in the hills above Edessa. Living on a sparse diet of bread, dried herbs, and water, he wrote and arranged hymns. Some were written to defend orthodoxy against the Gnostics. Ten years later, during a famine, Ephrem distributed food and money to the poor, eventually dying from exhaustion brought on by his ceaseless devotion to help others. Collect for Ephrem of Edessa: Pour out on us, O Lord, that same Spirit by which your deacon Ephrem rejoiced to proclaim in sacred song the mysteries of faith; and so gladden our hearts that we, like him, may be devoted to you alone; through Jesus Christ our Lord, who lives and reigns with you and the Holy Spirit, one God, now and for ever. Amen. 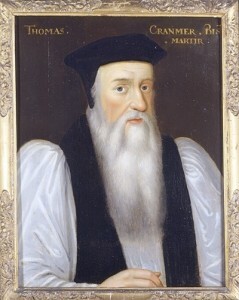 Thomas Cranmer (1489-1556) was Archbishop of Canterbury (1533-1556) and architect of the English Reformation. He was educated at Cambridge and, after ordination, became a diplomat in the service of King Henry VIII. In that role, Cranmer presented the case in favor of annulling Henry’s marriage to his first wife, Catherine of Aragon, to universities on the Continent. Henry, therefore, came to trust this priest who had embraced the message of the Reformation that was unfolding across the English Channel. His appointment as Archbishop of Canterbury, while still out of the country, was quite a surprise. During his diplomatic mission to Nuremberg, he had married the niece of Andreas Osiander, the city’s leading Lutheran theologian, which signaled that he had cast his lot with the Reformers. Cranmer returned to England, keeping quiet about his marriage, and was consecrated as a bishop in 1533. This happened with official papal cooperation. However, Cranmer quickly annulled Henry’s marriage to Catherine of Aragon so that Henry’s marriage to Anne Boleyn could be recognized. Anne Boleyn’s daughter, Cranmer’s godchild, would become the future Queen Elizabeth (the First). With encouragement from Cranmer and Thomas Cromwell, Henry’s chief advisor in ecclesiastical affairs, Henry ordered the dissemination of Bibles with English translations to parish churches in 1537. After Henry’s death in 1547, a young boy ascended the throne as Edward VI, and liturgical reforms, such as the use of the language of the people, soon followed. Those liturgical reforms included the Order of the Holy Communion (1548), which was meant to be inserted into the Latin Mass immediately after the priest’s communion, both to prepare the laity before their communion and to allow them to receive not only the bread but also the wine (i.e., communion in both kinds, which had been previously restricted to the clergy). The Book of Common Prayer (1549) extended the vernacular to the entire liturgy, and its first revision (1552) leaned a bit further into Protestantism. After Edward’s death in 1553, the daughter of Catherine of Aragon ascended the throne as Queen Mary (the First). She was a devout Roman Catholic and had Cranmer arrested and tried for heresy. Weakened, broken, and sentenced to be burned at the stake, Cranmer recanted his Protestant beliefs. However, from the pulpit of the University Church in Oxford, he dramatically reversed himself and testified to those beliefs on the day of his execution, March 21, 1556. Collect for Thomas Cranmer: Merciful God, through the work of Thomas Cranmer you renewed the worship of your Church by restoring the language of the people, and through his death you revealed your power in human weakness: Grant that by your grace we may always worship you in spirit and in truth; through Jesus Christ, our only Mediator and Advocate, who lives and reigns with you and the Holy Spirit, one God, for ever and ever. Amen. 82 Comments to "Ephrem of Edessa vs. Thomas Cranmer"
This is a tough one. I tend to vote a straight Anglican ticket whenever possible, but feel a certain solidarity with the people of Syria, who are enduring such horrible suffering right now. I voted Ephraim. He is more spiritual and less political. It seems that Cranmer turned whichever way the wind blew and lied! That is a large sin. He wanted the glory and prestige of Canterbury. Perhaps he recanted at the end, but I would trust Ephraim because of his humility, honesty and faith to Christ’s word. Ephraim was certainly was more mystical and spiritual and loved the Lord and His people more than himself. I’m trying _not_ to vote a straight Anglican ticket but as someone who chose the Episcopal Church as an adult I am so grateful for the Book of Common Prayer. Too bad we can’t split our vote or say “it’s a tie”? Well actually, you can always not vote. That will do the same thing as saying it’s a tie or splitting the vote. Winner takes all in each bracket. Lookers or Can’t Decide are not counted, but their comments might affect the votes in the next bracket. With a name like Hallas, why not vote Orthodox? I expect a convincing victory today by the English Reformer, although the results could be very different if the contest were on a Roman home court. Cranmer’s numerous recantations ordinarily might work against him, but he showed the ability to close out a game with his pre-execution return to form. If it’s a toss up, I would vote for the Anglican. Otherwise, my vote goes to the one who, in my mind, bears a more saintly character. In this case, I would consider dying from exhaustion brought on by service to others exemplifies sainthood! This selection is a tough one but Cranmer’s impact in the Reformation just seems to tip the scales in his favor. Both seem to have given their lives to God, literally. I wanted to vote for Cranmer exactly because he got it together at the end and paid the ulitmate price – he’s a real model for those of us who sometimes waver. But, having been Orthodox before joining the Episcopal church, I couldn’t resist voting for a fellow easterner – Ephren of Edessa. As a musician, Ephrem has a strong pull, but I can’t vote against the writer of the BCP. And the story of him recanting his recant is one of my favorites. I guess we really do vote with our tribe? Love the BCP but had to vote for Ephren of Edessa. A poet AND a martyr, who can resist? Though I am happy to learn about Ephrem and his ceaseless devotion to the poor, I finally am swayed by +Cranmer’s better beard. Perhaps he’ll win not by a nostril hair but by a facial one. Ephrem of Edessa all the way. Cranmer was inconsistent, albeit in the court of Henry VII that was hardly a surprise. He ultimately got it right. Ephrem was unconcerned with his personal comfort or safety. I’m going with Cranmer – Anglican connection and gratitude for the BCP, but also I think more mischief than good came out of the Council of Nicea, and Ephram’s songs were written in defense of Nicean orthodoxy. I do like Ephram’s service unto death, but Cranmer gets my vote. If only an Ephrem would rise up in Syria now. That desperate country needs such an one! As a cradle Episcopalian, it was hard not to vote for Cranmer. I am so grateful for and so love the Book of Common Prayer. At the end of the day, it is what brings us all together. Yes, I have succumted and voted Anglican in this round. I have questioned some of Cranmers behaviours but he ‘is’ the father of my beloved BCP. Yes, I have succumbed and voted Anglican in this round. I have questioned some of Cranmers behaviours, but he ‘is’ the father of my beloved BCP. I agree with Bill. Ephrem all the way. In solidarity with the Syrian people, I voted for Ephrem. Come on, how could ANYone vote for a schismatic over the “harp of the Holy Spirit.” And besides, Cranmer’s beard is overrated. ZZ Top has already done that. This was a tough choice but I voted for Cranmer. First because the Book of Common Prayer is such a gift to the entire Church and a useful tool to anyone who opens it. Also his life shows how God can use us in the most unlikely and unusual circumstances. Ephrem was a faithful person. I would like to hear some of the hymns he wrote. I voted for Cranmer, because, well, if Neil Alan Willard says “vote,” I say, “how often?” Seriously, though, anyone who can keep his marriage a secret is pretty impressive. I’m pretty sure I don’t know any priests who could pull that off. And I know a lot of priests. Of course I revere the man who gave us the BCP, but there is something about the asceticism of Ephrem which strikes a chord is this match-up. I voted for both of them. Seemed fitting, somehow. Hard choice! Of course Cranmer is important. He was one of the former of the Anglican Church from which we grew. And I love the BCP. But “the harp of the Holy Spirit” I must listen to that still small voice that sings to me. I like Cranmer’s humanity but I also like Ephrem’s attending the Council, and his upholding of the orthodox view point. However, it will be interesting to see who I finally choose when I vote. Good food for thought here. Another difficult one. I certainly appreciate the BCP and access to the Bible but Cranmer had a few too many personal peculiarities for me; a wife he did not publicly recognize for 15 years, a vow (to the pope) he did not intend to honor, and his vacillation in recanting. Based on the individual’s life I have to vote for Ephrem – -as shrouded in time as Ephrem’s life may be. Book of Common Prayer – great. This one is really hard. The BCP is so much who I am, but have to go with a fellow deacon who ended his life serving those in need. Ephrem, is someone who I could only pray to model my life and ministry on. although i sympathize with Cranmer’s difficulty negotiating the horrible politics of his time, i like the image of fighting spiritual battles with music. i have a feeling that ancient Syria could be a dangerous place, too. so i’m going with Ephrem. The minute I saw Cranmer’s name on the bracket, I knew my vote. Really, he had such significance historically and literarilly (is that a word?). As an Episcopalian of 40 years through my own choosing, I must vote for Thomas Cranmer. Admittedly he didn’t come off very well on The Tudors, but, honestly, where would we be without him? Vote Cranmer!!! I admire Thomas, but he did recant his faith only to later affirm it and be executed for it. But Ephrem never flinched in his faith and served the poor at the cost of his life. I too love the BCP, but I admire the Nicean Creed too! Tsk. No competition. His Grace has, in all humility, voted for himself. When I first read who was in the docket today-so to speak-I was sure it would be Cranmer but Ephrem’s life spoke of a far nobler effort without any of the luxury enjoyed by Cranmer. I vote for Ephrem but I am no less devoted to the author of the BCP. I guess I have to go with Cramner for round. The idea of a Prayer Book is really brilliant — a single book with all the servies available to both lay and clergy alike. That being said, the English language has changed tremendously since then. When I attend a service using Cramner’s language, my mind goes into neutral and the beautiful words flow over me but not into me. I also can’t spell. Sorry. This is about saintliness friends. Cranmer was a gifted writer and our prayer book is a treasure. Thomas Jefferson was a gifted writer but we don’t see his name on the bracket, do we? Lots of people write well but it doesn’t make them saintly. Go Team Ephrem! Cranmer a saint?? The ultimate church politician? Give me a break and give me Edessa all the way. If it weren’t for folks like Ephrem, there just might not have been a BCP. We all know that Cranner, in writing the first BCP, studied all kinds of liturgies from both East and West. Maybe he studied Ephrem’s work. In any case, I think Ephrem was the more saintly, hard as it is for an Episcopalian to vote against the good Cranmer. Even though I remain disappointed by his drift into Calvinist, I have to go with the Cranmer as the lead player on the home team. I agree with Heidi about saintliness although we are encouraged to vote for our favorite. For me it is not a matter of political leadership but who moves the heart. I admit that I am hardly an anglophile and I side with Ephrem, the theologian poet. All of the match-ups are quite thought provoking and are an enlightening Lenten exercise to more deeply learn about many of the saints of the Church. Although I am sure most folks will not see this before they vote… we are voting for the men, not the good book (BCP). I too love the bcp (though I am happily of the methodist family of saints) and were we voting a bracket of books, I might happily vote for it over any number of christian classics. But in this case the poet theologian teacher and writer of syria gets my vote over the politically mindful churchman of england. And surprise of surprises, I had never heard of his marriage and I consider myself a student of the english reformation… I guess as a methodist I just hadn’t read the right tomes. Not to diminish the beauty of the Prayer Book itself, but it was the CONCEPT of having the same book for laity and clergy that was so revolutionary. In many ways, the BoCP is at the heart of Protestantism. For this vision and courage, I voted for Cranmer. I was also torn between these two – but came to realize that it is only my Anglican identity which draws me more strongly toward Cranmer. And here’s the kicker in my mind…folks are voting Cranmer b/c of what he wrote primarily (besides just the Anglican loyalty, which is fine) but when you step back the writing should really be a push, at best. Ephrem’s personal holiness tipped my scale in his favor. But, it is a tough one! “It was here that Ephrem carved out his reputation as a writer, credited by one historian as having authored 3 million lines….” Death by self imposed exhaustion or death by execution? Hmm, I’ll leave this post, but now I’ll have to re-evaluate my thinking before the next bracket. Much as I love and appreciate the BCP, I agree with Ann, we are voting for the men and their character, not their accomplishments. Ephrem all the way! I’m pulling for Ephrem for many reasons. One being I can relate to his retirement situation. Ha ha ha ha, Kate!! Your line about “his retirement situation” was the best thing on here today! Today’s choices are very difficult. At first I was thinking Cramer. Then I reread the bios and thought, hmmm I am not sure. THis is going to take a bit of research. So as I did Saturday I am going to google both men and make a decision. THe comments here convince me there must be more. So I will get dinner started and then google the fine saints. THis whole voting thing and study of the saints is so interesting. What will I do after lent when this is over? Cranmer gave Anglicans the rite to full communion in both parts. Power to the people and no more Sarum Rite! Thanks Marguerite, I agree the BCP is a great concept but I need modern language to be able to absorb the words. I am fed when I can hold out my hands for both a crumble and sip in remembrance. Please forgive my disagreement, but it was not Crammer who gave full communion (the Eucharist, sp?) to the everyone. The Last Supper was not invitation only by way of denomination— all are in Christ. I too am Episcopalin, know th egreat things Crammer accomplished, but only use Jesus as exemplar of our faith. That said I do feel your need and desire to be “hands on” in communion. In Christ! I’m voting Ephrem. Cradle-Episcopalian here, and I revere my BCP, but I’ve never been an admirer of its author. When I was a child and was fascinated by the lives of the saints, it was always the ones who chose a life of poverty and had such sweet devotion to God that got to me. I always romanticized the idea of living as a hermit, and while I now know myself too well to think that I’ll ever go off to live in a cave and live on bread and water, I still have a soft spot for the saints who actually did. Having chanted the great litany yesterday, its hard to go against Cranmer. If only we had sung an Ephram hymn. I definitely will red the comments before I vote next time. I voted for Cranmer, but might have voted for EPhrem if given a second chance. I had to go with Ephrem. He was the real deal. Truly a man (saint?) of God. He contributed knowledge, beauty and devotion to the world, and he never waivered – to the end! What a wrench! Impossible choice between two poets of sublime quality, two giants in their own day and sphere! And while it was really, really hard to turn from Thomas to Ephrem, the dedication both to art and to service to God’s least and last pulled harder. Plus hiding a wife for all those years was pretty rotten. Plus the dreadful state of things in Syria…. And the one who sings does indeed pray twice: sing on, Ephrem! By the way, the only hymn we have in the Hymnal 1982 with Ephrem’s name on it is 443…never heard it, but it’s a good precis of the life of Christ. Anybody know it? I appreciate what was accomplished in the BCP and the spirit of balance contained therein. I agree with Solange that Cranmer is totally a church politician but I see that as a positive. England at that time needed someone versed in ‘the art of the possible’ to guide it through very turbulent times, and Cranmer contributed to that. However, much as I honour the historic accomplishment, I do not love being tied to the 16th century text and would vote against the BCP in a heartbeat (heartbeat? …or distant sound of drums coming to drum me out of Anglican church….?). I loved learning about Ephrem, who is wonderful, but his working himself to death sets a poor example for co-dependents and caregivers everywhere. I’m going with Cranmer for his role in helping pave Elizabeth I’s way to the throne. Also for his end-of-life courage and determination (holding out the hand that signed the false documents to burn first), finally staking his life on what he believed to be true. Where did Ephrem get that money and food that he distributed to the poor? Writers must have been paid a lot better in his day than now!! Baptized in the Methodist church, raised as a non-denominational evangelical fundamentalist and now a member of the PCUSA, I admit only an awareness of the existence of the BCP, having never used it myself. While I recognize the importance of the book, I can’t get past the image of Cranmer as an educated opportunist (thanks to The Tudors and innumerable Alison Weir-type books). I had never even heard of Ephrem (evangelical fundamentalists tend to be saint-impaired), but his life story got him my vote. In The Hymnal 1982 (Episcopal), Hymn #443 is attributed to Ephrem. I didn’t find an Ephrem hymn in the previous (1940) Hymnal. Anyone find other Ephrem hymns? A snapshot of Ephrem’s theology appears in his hymn. His life work faithfully serving the poor cannot be faulted. Cranmer’s politically correct gymnastics probably kept him alive a little longer. In the end, he too died for his faith. Codifying the litergy in the BCP was and is hugely important in developing and maintaing the Anglican faith tradition . Cranmer supplied the language of beautiful, heartfelt worship. Subsequent modern versions retain (well, mostly retain) Cranmer’s logic and words and syntax. Not slamming Ephrem, but following Cranmer. I posted some excerpts and links to Ephrem’s hymns here. Hymns and perishing in service to others. Gotta be Ephrem…. the full court press works best for the home team, but I’m voting with my heart and the underdog anyhow. Go Ephrem! I just can’t get over how many beautiful churches were ruined by the Reformation. Team Ephram all the way! Probably went with the tribal team today…Cranmer! As a cradle Episcopalian I’ve got to go with the creator of the BCP. My spiritual life, and that of all Anglicans, has been molded by that book, and therefore Cranmer. At bottom of the email it says “vote” but no link, had to go to the website to vote. Is that intended? Alas, we have no control over the details of how the email feature works. Perhaps we can fix it for next year. The email is intended to draw you to the website to cast your vote. If we could make the email say that whilst the blog post did not, we’d handle it that way. This is a terrible pairing for an early bracket; a number one seed against a number two seed. Choosing a saint who doubted and still found courage to die for his faith and one who probably helped raise Queen Elizabeth to be a reconciler over one who helped codify one version of the faith and then worked against those who disagreed. In matters of faith I tend to trust those who are honest enough to doubt. Go Cranmer! After checking “Notify me of follow-up comments ….” & “Notify me of new posts….”, it is obvious we are all enjoying this! Now the question is: Should we read the comments before we vote or vote based on the published commentaries? Remember, “Protect the Halo”; vote once but comment often! I’d like to vote on a double bracket where the those with less votes would be paired. Not sure how that might work. So, when do the polls close and the voting counts? Based on the time stamp of my original post, I posted mycomment in CST (I had already voted) and it was posted as EST – I think after the voting was closed. Jesus was given/sent for us all. Although Crammer finally at imminent execution recanted and came back to the faith for all people, Ephrem still worked diligently in the likeness of Christ. He feed the poor of nurishment to the body and their spirit. Today, if we all who follow Christ’s example how little poverty would be seen, especially in America? We are the body of Christ, left here to continue his great comission. That said I vote for Ephrem. 2 Trackbacks to "Ephrem of Edessa vs. Thomas Cranmer"